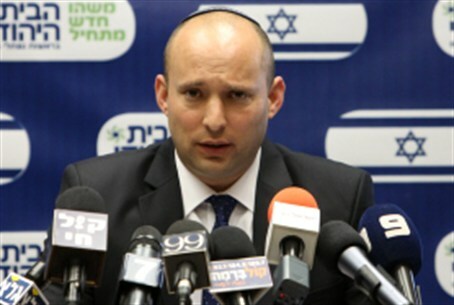 Economics Minister Naftali Bennett said Sunday that he would not allow Hesder yeshivas to be damaged by proposed changes in service requirements. Bennett made the comments after the Ministerial Committee on Equal IDF Service decided to require Hesder Yeshiva students to serve 24 months in their army units, instead of the 16 months that had been required until now. The idea was promoted by government minister Amir Peretz, a member of the Hatnu'a party. “We cannot allow these soldiers to continue serving only 16 months,” Peretz was quoted as saying in a recent interview. “As we attempt to ensure equitable service for all, we cannot allow one group to remain outside the new norms we are establishing. I do not intend to compromise on this. We are talking about a lot of soldiers, between 1,200 and 1,500. Sixteen months is not an effective service, and the contributions of these soldiers to the army is small,” Peretz added. Bennett responded sharply to Peretz's comments. “I will not allow the Hesder students to be harmed by this plan,” he said. “I find it very strange that Peretz is targeting a group that has over and again proved its worth and contributions to the country, beyond the shadow of a doubt. There are many places, among them many that Peretz and his party boss Tzippy Livni know quite well, where there is a great deal of draft-dodging, complete contrary to the motivation and contributions of the Hesder students. “Eighty-five percent of Hesder students join special combat units, far higher than the average 72.3% of other soldiers,” Bennett said. “In addition, the graduates of these programs fulfill their reserve duty service loyally. This great enterprise is a backbone of Religious Zionism, a fulfillment of a vision, a joining of the learning of Torah and accomplishments. I will fight any attempt to damage this enterprise for unclear reasons with all my power,” he added.